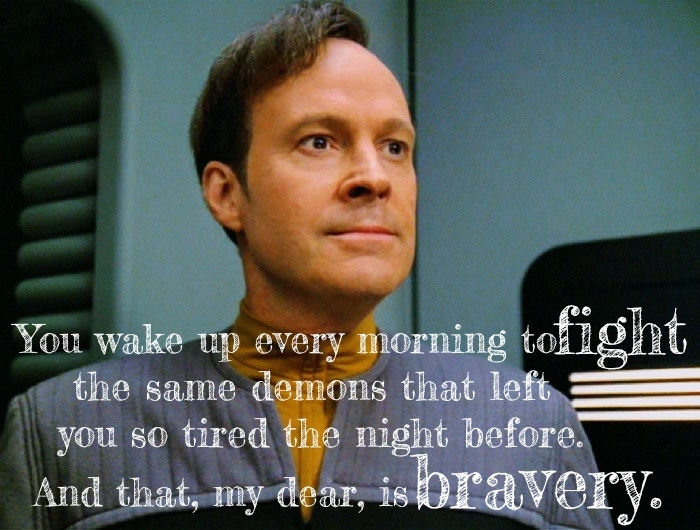 Some days ago, an on-forum discussion happened about Reginald Barclay's social anxiety disorder, and it quickly turned into a discussion about mental disorders and psychophobia. That made me realize our forum may benefit from a support group about mental illness, mental disability and neurodiversity. So I decided to open a new thread, as I couldn't find a recent one to update. If the mods are okay with it, I would like this topic to remain controversy-free, in the sense that people should not post psychophobic things or negate the reality of mental illness and neurodiversity. As a person who lives with a generalized anxiety disorder as well as other mental specificities (including autistic traits), I know how enfuriating it can be when neurotypical people try to tell us to "just shake it off" or to "stop thinking about it". I hope this thread will be helpful to as many people as possible ! Amaris, Armus, TribbleFeeder and 6 others like this. First: I really appreciate someone who supports Reg Barclay. Just yesterday I saw a Law & Order episode. A girl with bipolar disorder discontinued her drugs.... with symptoms resurfacing with bad consequences. Her friend told her over again that drugs mean being mind-controlled. They can also mean remaining mentally healthy. She was forced by the judge to accept help. She agreed to take her drugs again. I know that psychotropic drugs may have side effects. I worked with people who refused to see a specialist for mental health. They refused the drugs in fear of getting fat. They accepted their symptoms instead. My experiences showed me that women are more inclined to get help then men. I hope that I didn't post anything offending and I hope you receive many likes and support here. I'm a bit of a shy person myself, so I can relate to characters like Reg! Twilight Phoenix and Cutie McWhiskers like this. It's always great to have a place where people can understand and accept what you're feeling. Because a lot of these issues are invisible from the outside people don't always know you're not feeling well or they think it's all in your head and you just need to get over it. So many times when i was dealing with anxiety or depression my ex husband would just say i was being lazy when i didn't get out of bed, or that i had no reaaon to be sad and to just stop acting that way. Armus, The Lensman, Twilight Phoenix and 1 other person like this. Lack of drive is not laziness. People don't understand that. And their coping strategies are dismissed as nonsense. SolarisOne, Armus, INACTIVERedDwarf and 4 others like this. Then, if one realizes that even those, such as myself, with very stable mental states, know many who are not so fortunate, it seems to me that a vast majority is either directly or indirectly affected significantly by mental illness. A support group can be a great help to those with mental illness/disorder, but might even be a greater help to those who love someone with a mental illness/disorder. I can't say knowing someone with mental illness is worse than having a mental illness because I doubt it is true and I have no reference to judge, but I do know that it is very difficult to see someone in need of help and to be powerless to help. More than once I wished the affliction was cast upon me instead, as I didn't think I could survive another round of the fight. I know one should be careful of what one wishes for, but despite that, I wished it many times. feral.cherub and Twilight Phoenix like this. Over a year ago, I posted the following in a thread about Barclay. Since it seems apropos to this topic, I will repeat it here. In his excellent 2010 book Neurodiversity, psychologist Thomas Armstrong, PhD argues for a major paradigm shift in how we think about mental functioning; just as there is no "baseline" or "standard" race or culture, neuroscientific research increasingly shows that there is no "standard" brain type, and the diverse spectrum of differences should not be automatically stigmatized in knee-jerk fashion and regarded as "diseases" that have to be "cured." Rather, different brain types have their own gifts and advantages. He includes a case of people diagnosed with Asperger Syndrome (which has since been integrated into autism spectrum disorder in DSM-5 rather than being a separate diagnosis) excelling at software testing. A more enlightened and accepting society in the Federation would undoubtedly be structured to accommodate such diversity and work with it instead of pathologizing it, especially considering how radically and incredibly different the brain functioning and social behavior would be in the multitudes of non-human species. There is a place for all of them in the Federation and in Starfleet. Barclay is excellent at what he does. He might not be excellent in other positions such as command or security, but he does not have to be. Picard wouldn't be good at what Barclay does. Starfleet has many different roles, and a great number of them are undoubtedly very specialized and take special innate talents and unusual modes of thinking. SolarisOne, Amaris, Armus and 6 others like this. Her friend told her over again that drugs mean being mind-controlled. This is unfortunately a very common misconception - to think that taking psychopharmaceutical medecines will 'control' the person's mind and prevent said person to be themselves, when it's actually the exact contrary. Our disorders aren't us. They actually prevent us from being who we really are, especially when the symptoms are violent and permanent (ie in the case of panic attacks, severe schizophrenic hallucinations...). I don't know what the stats are, but my experience is that this is an understatement. If I look at the people who are closest to me, it so happens that a majority of them have had mental disorders of varying degrees from depression, to anxiety, to manic-depression and sometimes worse. If I remember well, the WHO estimates that 1 person in 4 has a mental illness, and 1 person in 5 in the USA. So this is indeed an understatement to say we're not alone. At least a 25% of the world population lives with mental issues. Steven P Bastien likes this. This friend in the Law & Order episode was asked by the prosecuter if he had studied medicine and psychiatry. He said no, he just read about scientific papers and studies. And with what he learned out of it he influenced the girl. Not in a helpful way. Someone told me there are cases where drugs are the only way for help. It is difficult to convince people that they need treatment, therapie and/or drugs and to be patient with their diseases. Especially when they have physical diseases and have difficulties to deal with them. Some of my former clients with mental problems enjoy all kinds of arts: silk painting, poetry, craftsmanship. And they are very skilled at it. Twilight Phoenix and Nakita Akita like this. It is difficult to convince people that they need treatment, therapie and/or drugs and to be patient with their diseases. If we lived in a more open-minded society that was more compassionate towards mental illness, I'm convinced people would be less reluctant to ask for help. That's why I consider it so important to talk about it openly and to offer people safe spaces of validation and expression , so we can slowly get rid of the mental health stigma. Avro Arrow and Gryffindorian like this. It also depends on your social environment. I came to realize that people without close family and friends struggle even more. It's a crying shame. The Lensman and Sophie74656 like this. Yes, it can be even harder to reach for help when there's no one by your side...Having a compassionate, supportive social network really helps with all the process of therapy and treatment. I'm sorry you had to see loved ones suffer, but that makes me happy to think there are still people like you who want to stay and help the best they can. Living day to day with mental illness takes courage and strenght, no matter if you are ill yourself or indirectly concerned. SolarisOne, Steven P Bastien and Kilana2 like this. There was the German goalkeeper Robert Enke who suffered from depression. He committed suicide. It was then when the people stood together and mourned. He was afraid of loosing his children. He had already lost a child to a heart disease if I'm not mistaken. And this is too much even for a strong person to go through. Soccer/Football is a big business and a lot of money is involved. His wife launched a foundation in honor of her dead husband. Where I went to school there were kids that were called The Special Education kids. Right in your face and hit you,spit on you, stuff like that. But when I was older I had some soecial Ed. Kids as friends. One girl had epilepsy. She missed a lot if school due to it. She said that she was in Special Ed because she was always so far behind from missing. Another friend was weird, but I never thought that she was THAT weird. ( if that makes sense) she was a teenage girl, I mean so was I, she just didn't seem weird to me. People used to give me crap for having special Ed friends too. It bugged me that they were such jerks about it. One time I said that they should come and meet one of the girls, and they were like, "No way!" So I walked away from the "normal" girls and went and talked to some of the Soecial Ed. Friends and the Special Ed friends are like, " we can't believe you walked away from the normal kids to come over here to the R****d group! Are you stupid?" I hated being around kids since I was about 9 years old. When you get right down to it, other than someone yelling inches from your face or hitting you, etc. I think a LOT of people have issues. One of the "normal " girls got pregnant at 15 and the other one was like a meth head/ crack whore after highschool. I think normal sometimes is subjective. Random_Spock, Jayson1 and Twilight Phoenix like this. As someone who has had bouts of generalized anxiety, OCD, and depression, thank you @TauCygna for starting this thread. We had a mental health thread a couple of years ago, and at the time I was experiencing "Pure-O" symptoms. The term "pure obsessive" is a misnomer, because it indicates there are no compulsions (behaviors) associated with the "intrusive thoughts." However, the thought patterns such as avoidance and reassurance-seeking are, in and of themselves, compulsions. It helped that I was able to talk about my condition with other individuals in this forum, such as @rhubarbodendron. Prior to that time, I had been on Prozac for 11 years. When my anxiety resurfaced in the fall of 2016, every waking moment of my life was like a nightmare. The intrusive thoughts tormented me, made me question my own character and sanity, and gave me tremendous guilt, shame, and anxiety. After my psychiatrist upped the dosage of the antidepressants I took, and after having attended an 8-week mindfulness-based group counseling, things fortunately got better for me. With professional help, things can and do get better, but you have to be proactive about getting the care you need. I still practice mindfulness meditation at least 10 minutes every day, and I'm still learning to be mindful and equanimous. Jayson1, rhubarbodendron, Nakita Akita and 2 others like this. It totally is ! And that's why we should...cut the crap ( ) about that norm pressure. 'Normal' just means 'average', but when it comes to brain structures there is no 'average'. There are only very recurring patterns and less recurring ones. Brain expression exists as a continuum rather than strict archetypes. As someone who has had bouts of generalized anxiety, OCD, and depression, thank you @TauCygna for starting this thread. Random_Spock, Cutie McWhiskers and Nakita Akita like this. I offered my clients courses for progressive muscle relaxation. Some liked it and some refused to try it. ADHD clients told me they would even get more aggressive by trying such excercises. They prefered sports to burn off energy. Been there, done that, got fat, then saw another specialist who rescinded previous diagnoses because those were made in error. It gets sickening telling people that lack of diet and exercise and "Just consume less than you burn" (which is a line that actual people certified to work in the medical field also debunk) are grossly oversimplified. I usually watch shows to see a mix of character types and how they interact and without focusing on any one type (nor do I want to be pandered at), but I will admit Reg was an exception in terms of seeking out "people not dissimilar to me"(tm) as I was always thrilled to see him return - even if he was in a role other than Murdock as Murdock would have been a lot more fun for any actor to play. Partly because Reg was an actual character and not a cardboard cutout. There really are no ideal 'baselines' because each person is an individual and, in a large sense, a world unto themselves. Unless there is harm to others involved, or a person requests it because of issues they have identified that they want help with, some things should be left alone rather than 'treated' with drugs. Love and humor mean a lot. My wife and I have fun with our OCD. One will straighten a stack of books or something and turn to the other and say "Beat ya!" And the other will say "Just barely!" Random_Spock, Nakita Akita and Cutie McWhiskers like this. I don't really agree with the "better left alone" idea, since such philosophy often leads people to stay alone with their mental issues and to silently suffer, instead of reaching out for help. But down the road, you're right - people should have the choice of dealing with their illness the way they prefer (unless there is an immediate safety risk for them or others). And the severity of symptoms really makes a difference too. I don't know your situation so I won't assumptions, but the OCD I used to suffer from as a child and teenager were something I never could have made fun of, because they basically ruined my life. I felt like I absolutely had to turn that key for a 9th time, clean my hands for a 5th time in a row, or grab the handle that exact way, unless I'd throw a panic attack immediately. Jayson1, Gryffindorian and Cutie McWhiskers like this. All depends on the individual and, yes, the severity. I didn't intend to downplay the severity of some cases of OCD and its effects on sufferers. I just meant that, sometimes, togetherness can establish some very good coping mechanisms, depending on the couple. rhubarbodendron and Twilight Phoenix like this.